When prospects look at a property to buy or rent they often base their decision on small things. The color of the fixtures, the color of the carpet, and paint can play a huge factor in the decision. 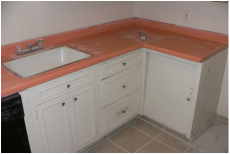 Are your fixtures dated or odd colored? Is your money going down the drain? It’s a proven fact that the money spent to refinish fixtures is quickly recouped. Sell or rent your properties faster and for more money. Stretch your bucks. 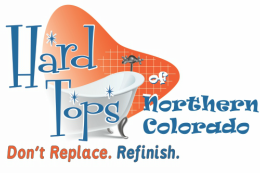 Call today for a Free Estimate on refinishing (970) 686-6797. We thoroughly prepare the old surface, followed by six coats of the most advanced polymerized acrylic urethane. In all applications, our unique process utilizes "crosslinking", in which molecules of the applied coating bond with those of the original surface. 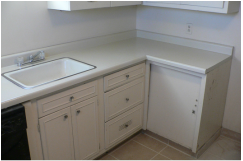 This inhibits penetration by bacteria or other impurities and produces up to 40% more durability than with coatings used by most refinishers. On porcelain fixtures, our special bonding agent forces the new coating to expand and contract with the original surface as heating and cooling occur, preserving the integrity of the new surface for years to come. The process generally takes less then one day and in most cases can be used within 24 hours. Save up to 70% off the cost of replacement.